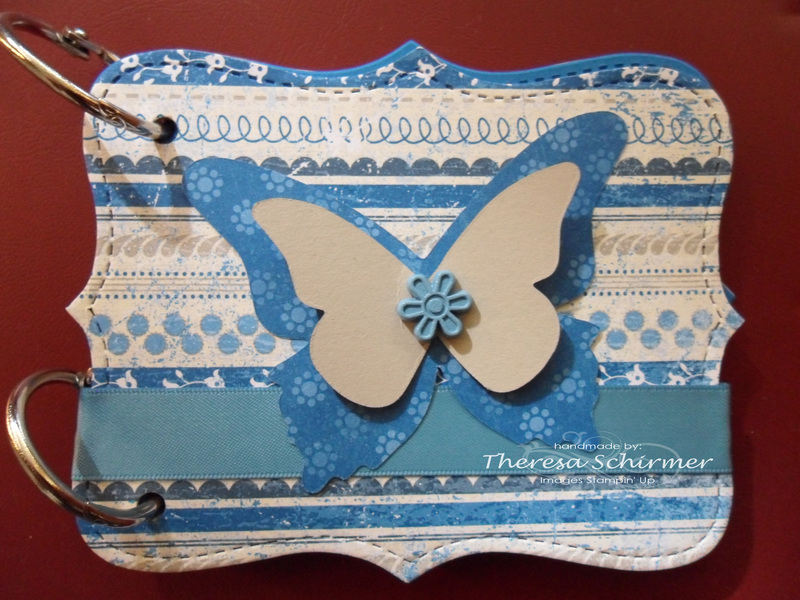 Hi fellow crafters, how are you all? I am hoping everyone is just fine. 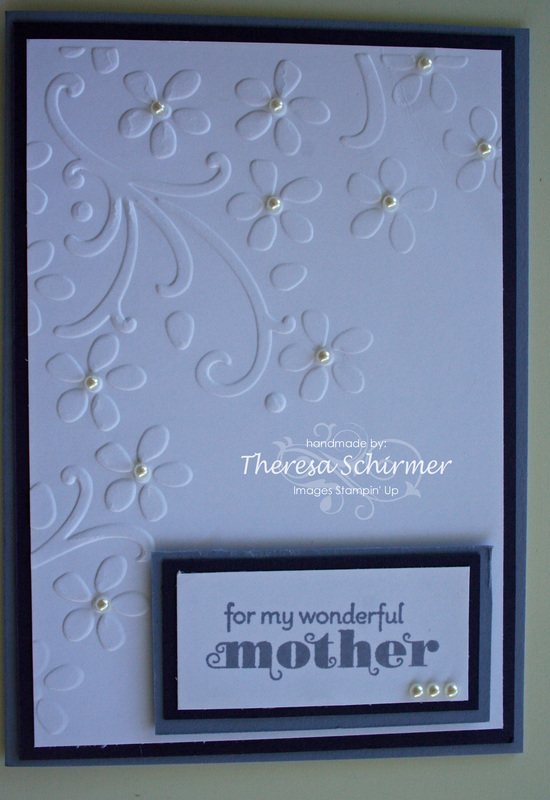 I am pleased to announce that after almost 5 years with Stampin’ Up!, I did my first ever class today. There were 9 ladies there all enthusiastic, 3 had previously stamped and I had 5 or 6 that had never stamped before!! 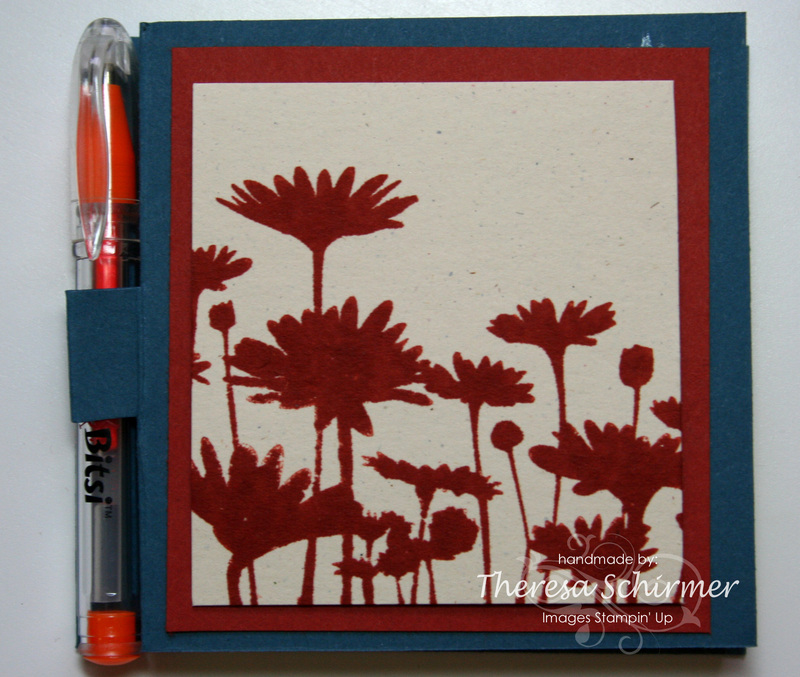 We did one card today and what an introduction to stamping it was. 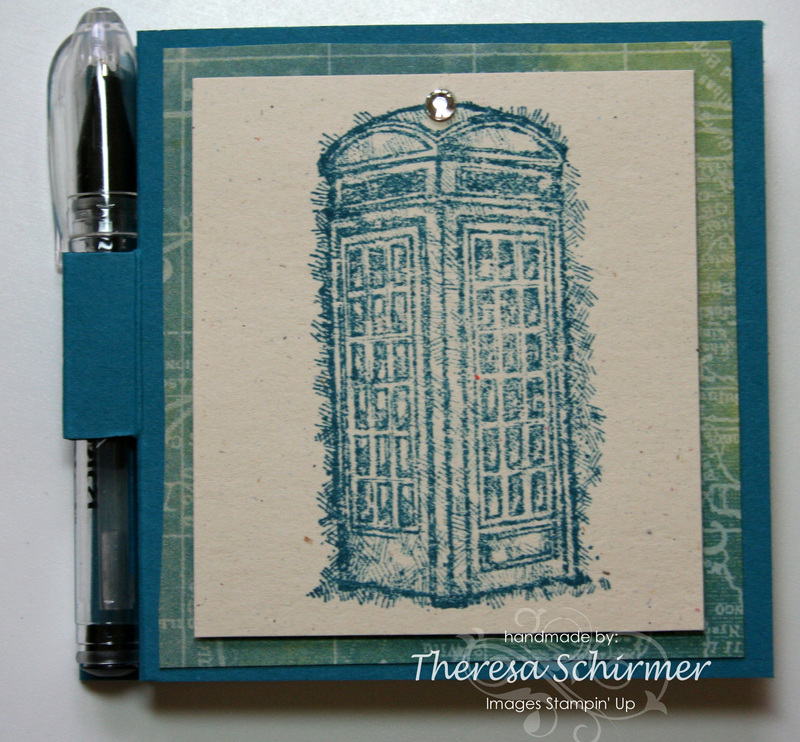 I wanted something that was going to be a wow factor so that beginner stampers went home with an awesome card not just a stamped image matted and tied in with a sentiment. 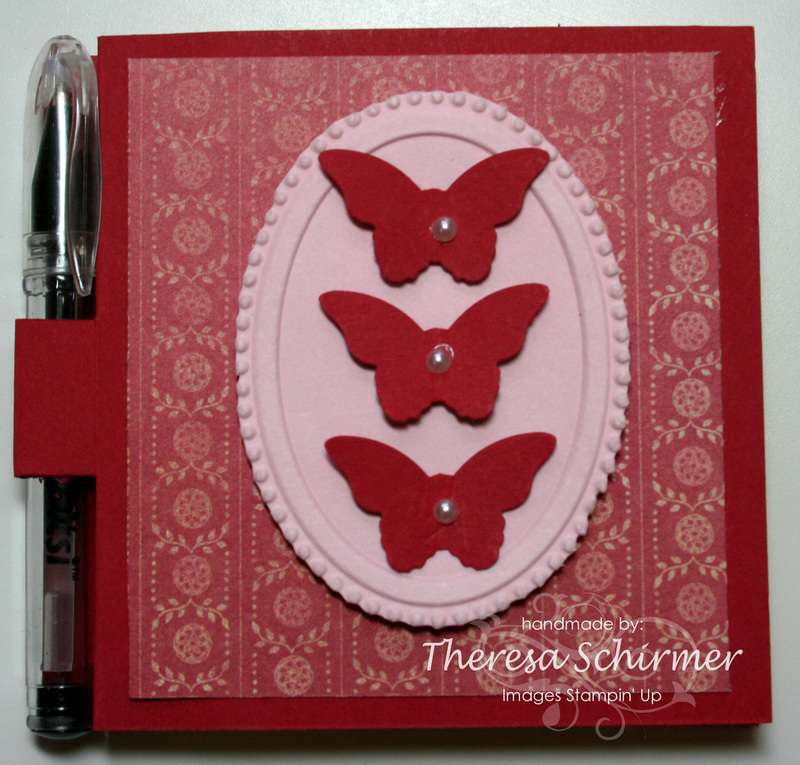 I believe the Triple Time Stamping I did with the ladies gave a fantastic first impression of how fantastic the stamp pads are from Stampin’ Up! 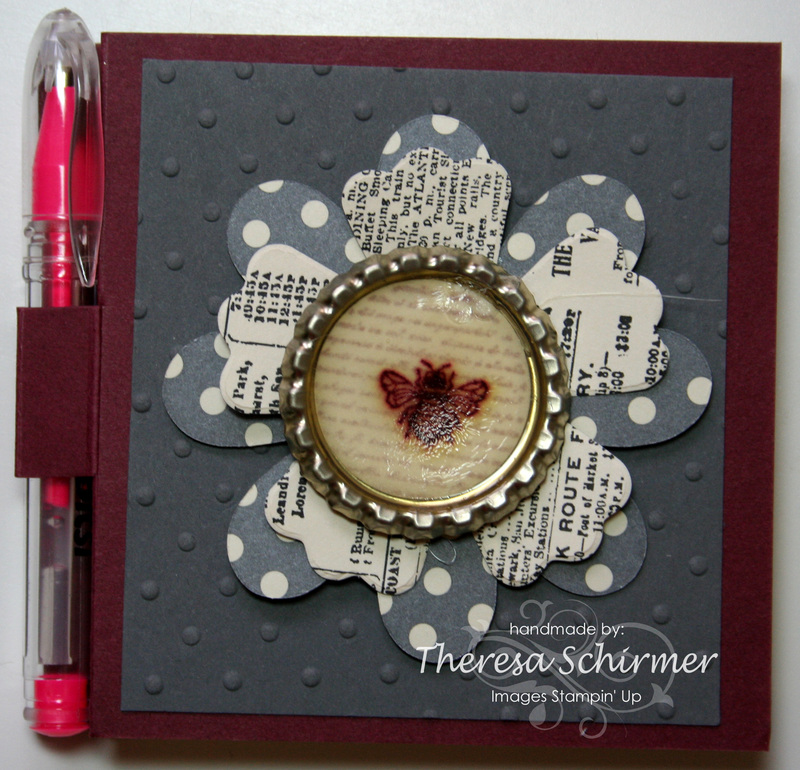 and it was a great way to introduce stamping to ladies that had never stamped before. They all did very well and were very pleased that they had made such a lovely card for a beginner, the other ladies that had stamped in the past had to have a little lesson on how to use those especially “juicy’ stamp pads and it took some getting used to from hard tapping on the stamp pad to a lighter touch to ink up the image and stamp. They were pleasantly surprised at how fantastic the new formulations are, once they got used to them. I remember other demos suggesting to take some baby wipes at classes to help with the extra inkyness, I am so glad that I put them in for clean up of hands and sometimes to clean up over inking. I made 3 samples and gave the participants the choice between a masculine type card and a feminine card. 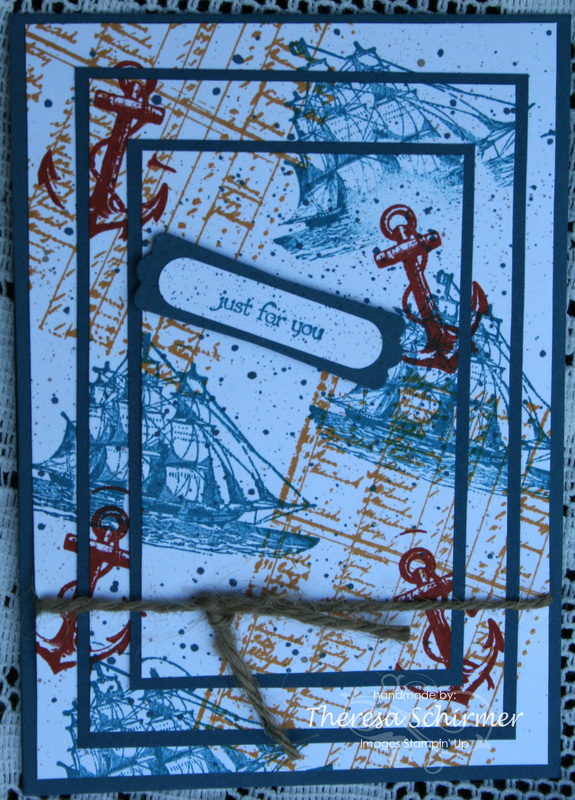 Most chose the masculine card to do and opted for a generic saying such as “Just for You” from the Teeny Tiny Sentiments Stamp Set. 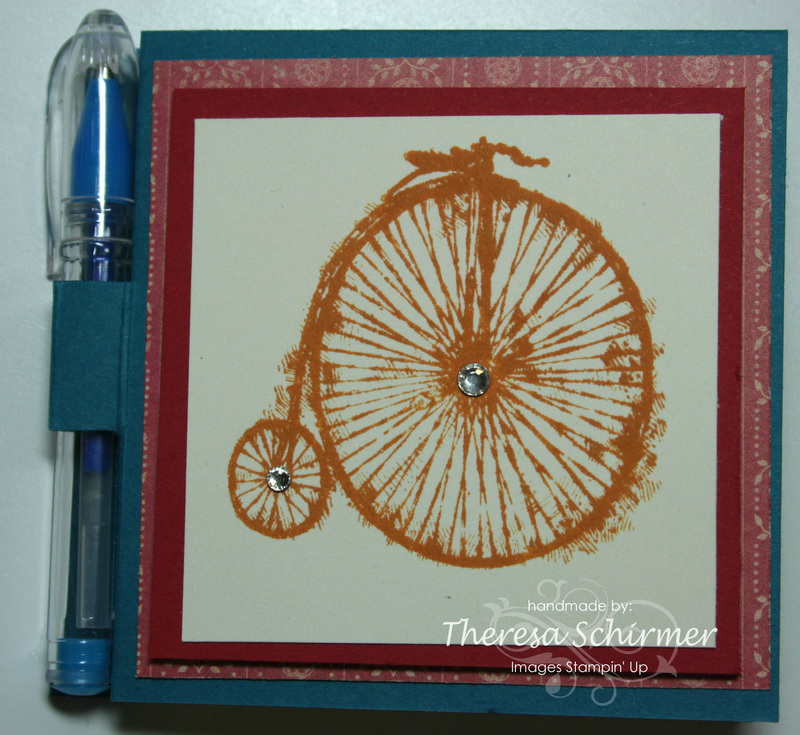 I have to admit it is my most go to stamp set for placing sentiments on the front of cards. They are just the right size to be not too overpowering for the stamped images. I have to say the cards turned out awesome and I felt a small surge of pride to see these ladies enjoy themselves and they really loved what they produced today. Here was the alternate choice for those that wanted to a little more feminine. 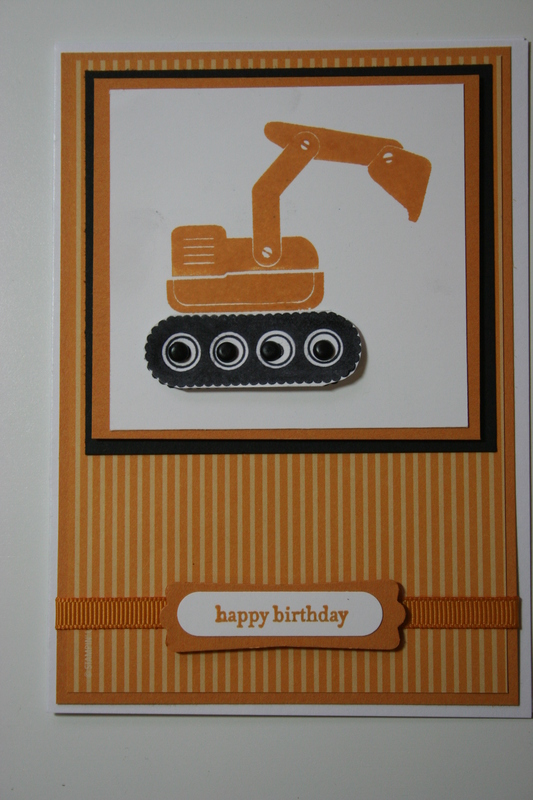 They did really enjoy themselves and I had everything cut ready to go so the focus today was strictly on stamping. I also used the Colour Spritzer tool so that the white base was not so stark. 2 ladies loved the tool so much that they ordered it!!. 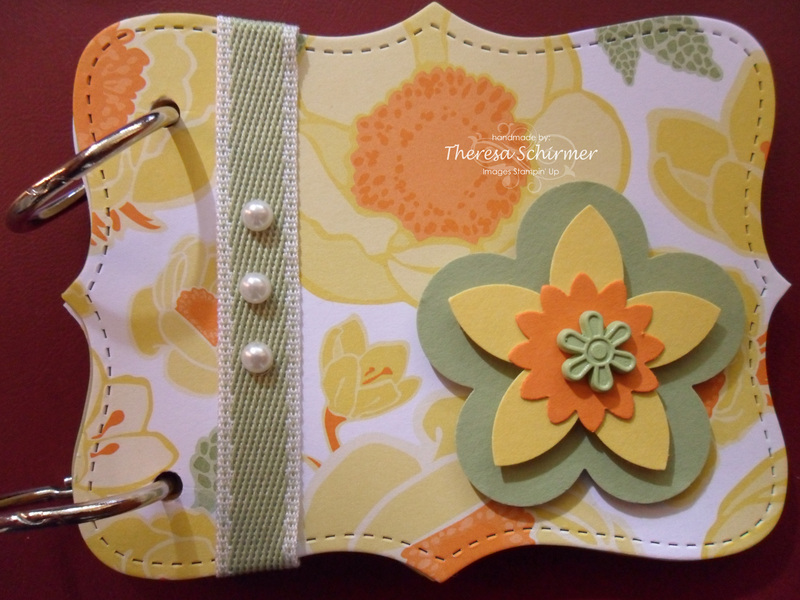 I just decided while making samples for today’s class to do a slight twist on the basic stack. 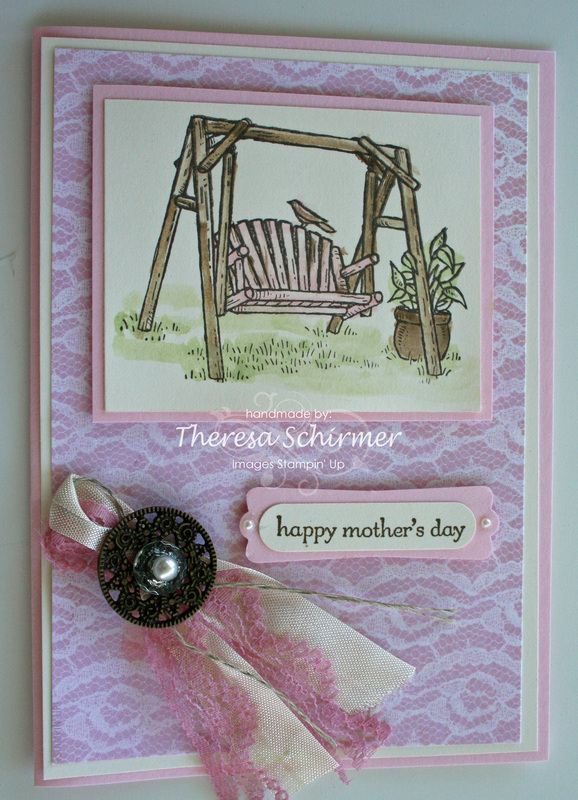 Here is what I came up with and I did case this one from the internet, there were so many blogs with this similar card that I dont know which lady to give credit to on this sample below as there were a few samples online with different blog addresses and names on them. As you can see just a slight twist on the original design and it still looks spectacular. Well I just had to share with you my first class and I feel it was a success. I am looking forward to another booking for a class with these ladies in a months time. Once again another month has just completely flown by and I really have been so very busy. 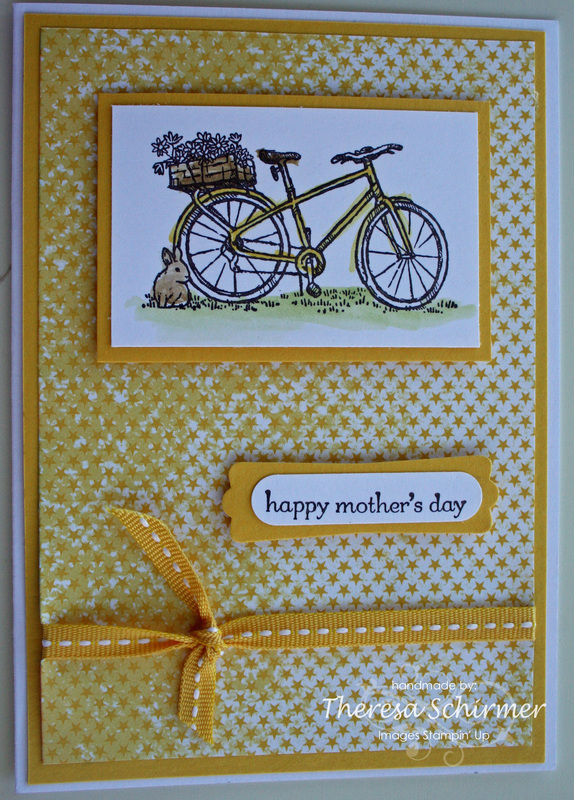 Today, I am going to show you some Mother’s Day Cards that I have made to sell at the Handmade Expo Market in Morayfield tomorrow. Here are some pictures of my stall from March, these were taken by Avonlea Photography, take a scroll through her page its simply wonderful! I do have a few more to post but will leave it at this today. Thank you for stopping by and looking, I hope to see you at the Handmade Expo Market at Morayfield tomorrow. Pop on over and say hello. Hi, welcome back and thank you again for stopping by for a peep. Today, I thought I post up some Mini Albums that I have been selling at the markets for over 12 months now. They make lovely gifts for everyone. 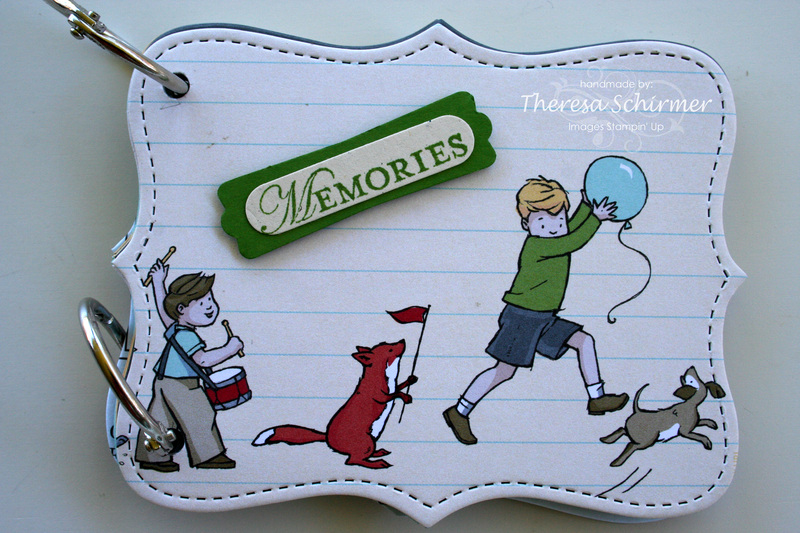 A great way to capture a couple of important events and record them in the mini album and post off to family. I have sent a couple to my family members and they love them and its like a little brag book that they can take with them to show their friends. Before I go too much further, I must not take credit for this idea, my friend Shirley from Stamping Elephants showed me this idea probably nearly 2 years ago now and its funny as I have only really had them on my market stall for about 5 or 6 months. Thank you Shirley for showing me this great idea. 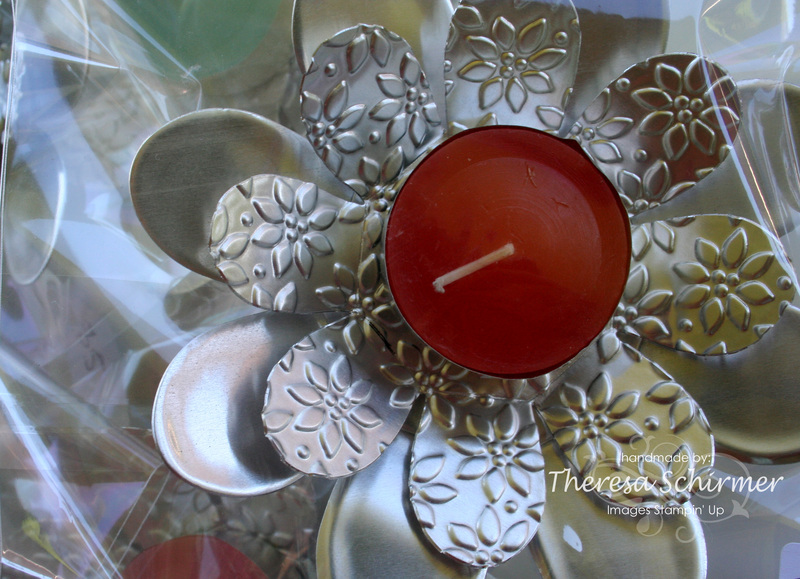 You should pop over to her blog as she does some of the most wonderful things. This is the most recent one and I thought it would be good for those back to school or first school days photos that we all get and lovely to pass onto grandparents so they dont miss out on all the fun. There is plenty of room inside for photos and journalling and I have coordinated the pages inside with the DSP. 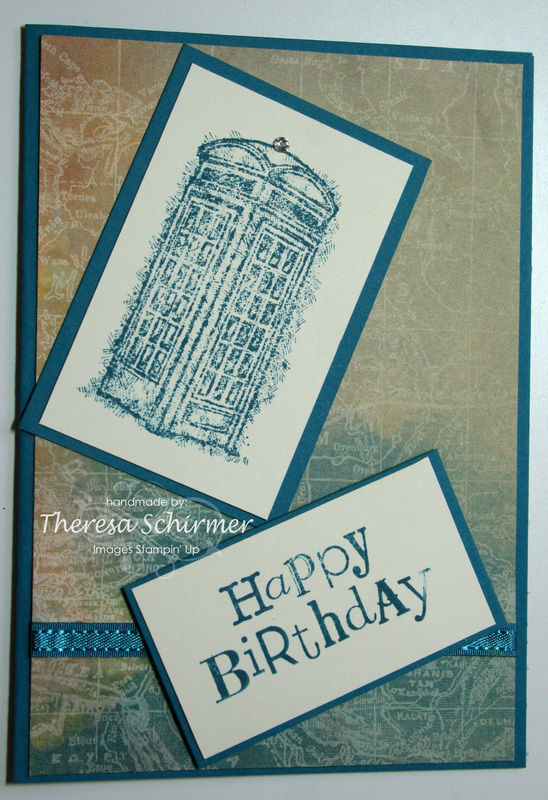 These 2 were made with retired Designer Series Paper from Stampin Up. 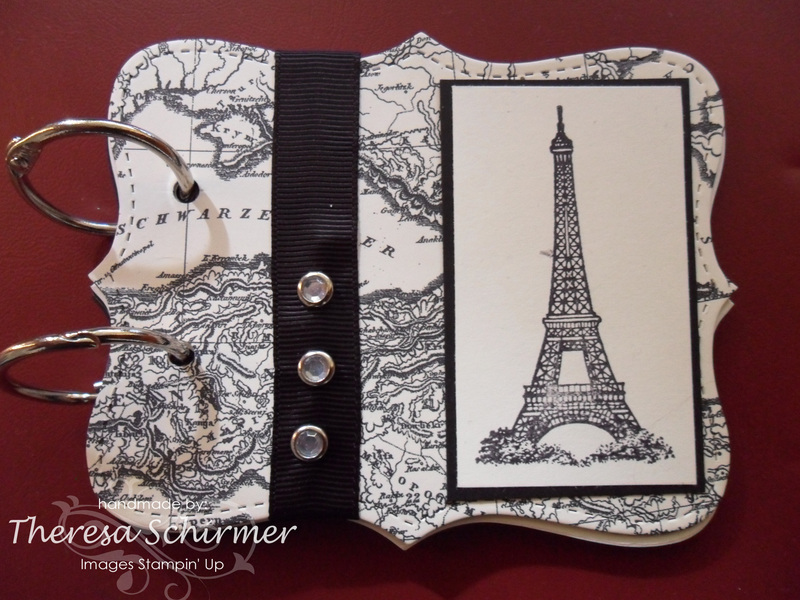 I had quite a few papers left and made them into these albums. I must say they do look great. and last but not least one made with some of last years In – Colour, Blushing Bride and the special DSP that went with those in- colours. I must say they do look great and are selling at times really well. They make great gifts. 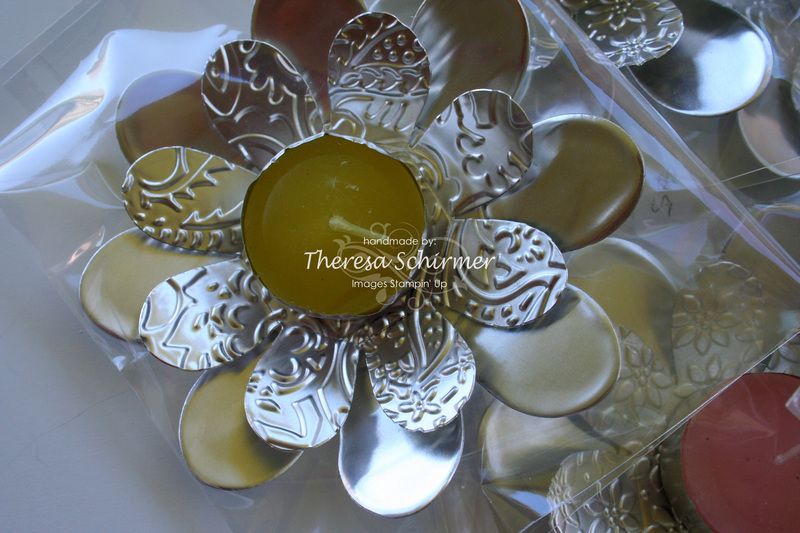 Thank you for stopping by for a look and be sure to have a look at my friend Shirley’s Blog. She really does do some awesome stuff. Hi fellow crafters. Its Monday morning here and I must admit its a little hard to get moving or even poke my nose out the front door.! Yes it appears to be raining again and lots of it! Plenty of time to do more crafting. 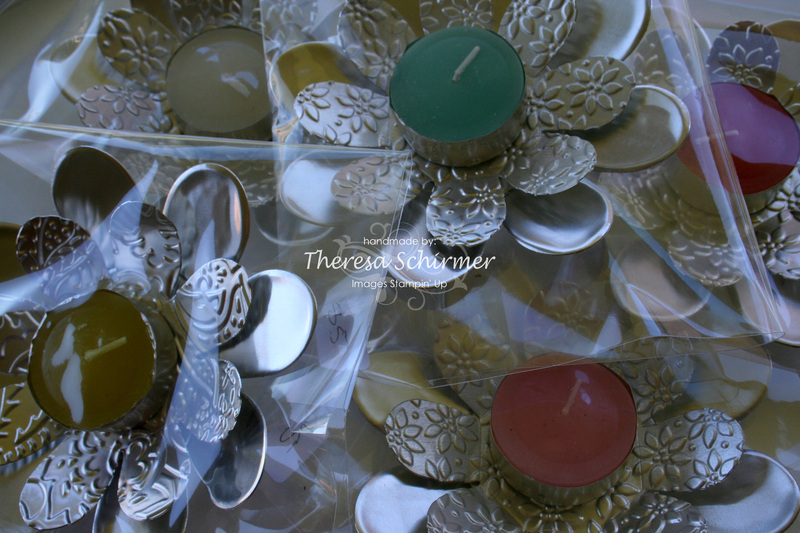 This is a good thing as I like to have a big variety at the Handmade Market Expo in Morayfield this Sunday. If it hasnt rained too much it should be a good day especially with it all being indoors the weather will not hurt us at all unless its too much rain. Here is one that is similar in colour to Riding Hood Red. And a group shot ready to go for the Market this weekend. I hope they go a treat. I love the way when the die cuts the aluminium that it neatly rolls the edges, therefore there is no risk to cutting fingers. Once that candle is finished, its just simple to put another in the centre. Thank you once again for stopping by and looking at my blog. Hi there what a fantastic time to earn Free Product. Simply order from either the new Seasonal Catalogue or the Annual Catalogue or a combination of them both to the value of $100 and you can select 1 free product from the Sale-a-bration Catalogue!! and of course the telephone box accented with a rhinestone just in the right place!! 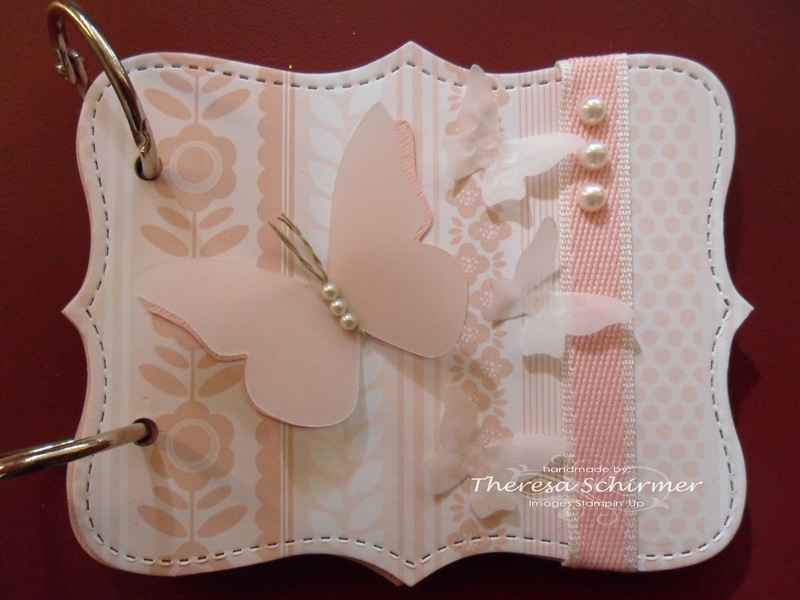 I also do “Fridge” notebooks, so called as there are magnets on the back to attach to the fridge for shopping etc. They fit a shopping list sized notebook or half of an A5 pad that I usually get cut at Officeworks but you can get the already cut in the Discount stores. IThey are popular at the markets at various times of the year. I love the “Old World” charm of these stamps. Why not have a look at the link on the side and see what you would like to order. I am going now. 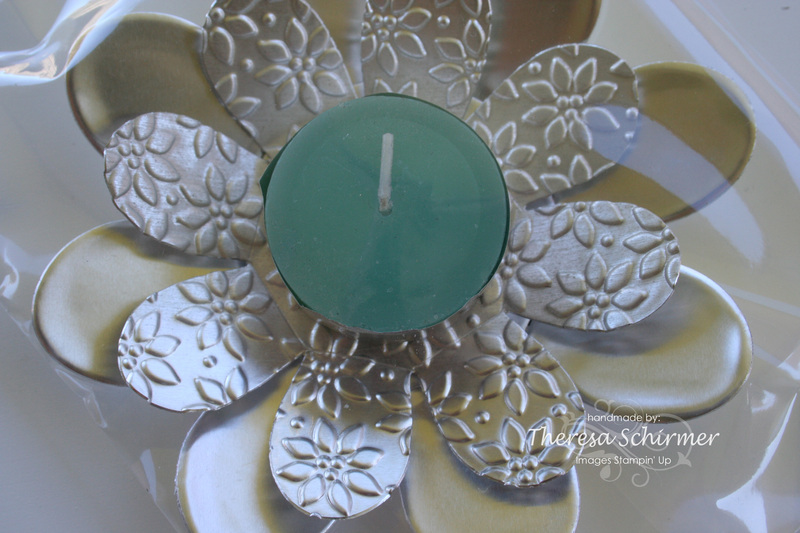 I hope you have enjoyed looking at my post today!! I hope you have a great day and take care. I have been wanting to use these soda pop caps for a while. I have filled them with Crystal Effects. This has been matched up with Pool Party and some DSP from the More Amore DSP. The DSP, Caps and Stamp Set are all from the new Seasonal Catalogue. This is a very popular style that I make. I dont have the heart to part with it as its so quick to use and make up. The beauty of some of these post its is that I can make a few up and it cleans my desk of scraps too. Hi and thank you again for stopping by. 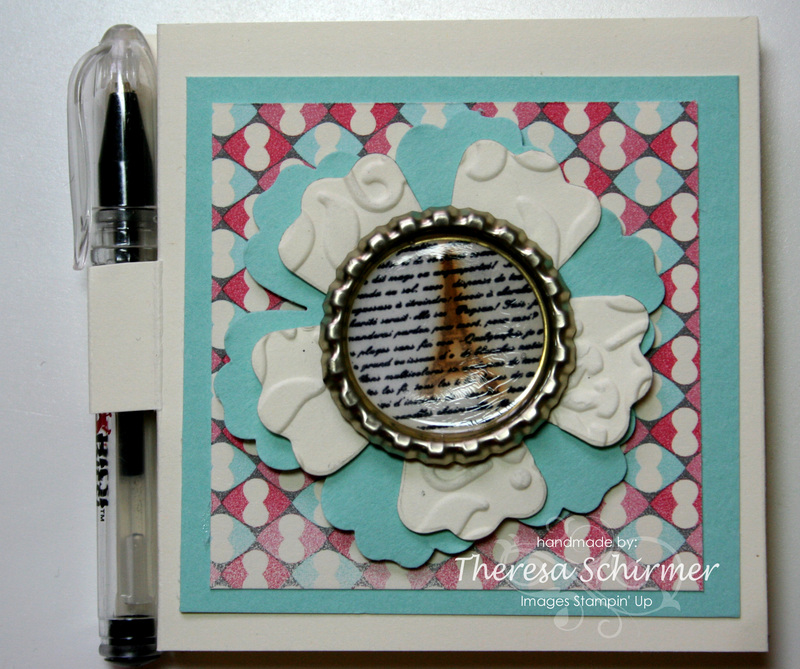 I have been playing with the stamp set “I Dig You”. I decided to try and use colours as close to “real’ things as I could. After working on a construction site for almost 12 months I got to see a lot of diggers so got to know the colours pretty well when it was my job to ‘spot’ for them. 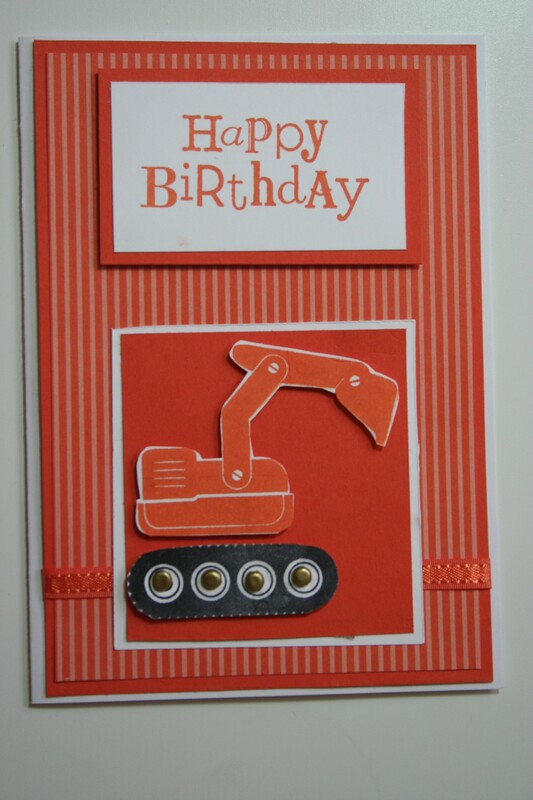 The thing is, I think these cards are going to appeal to those big boys that love their big toys nearly as much as the little boys will like them. This colour usually goes with Hitachi and their heavy machinery. 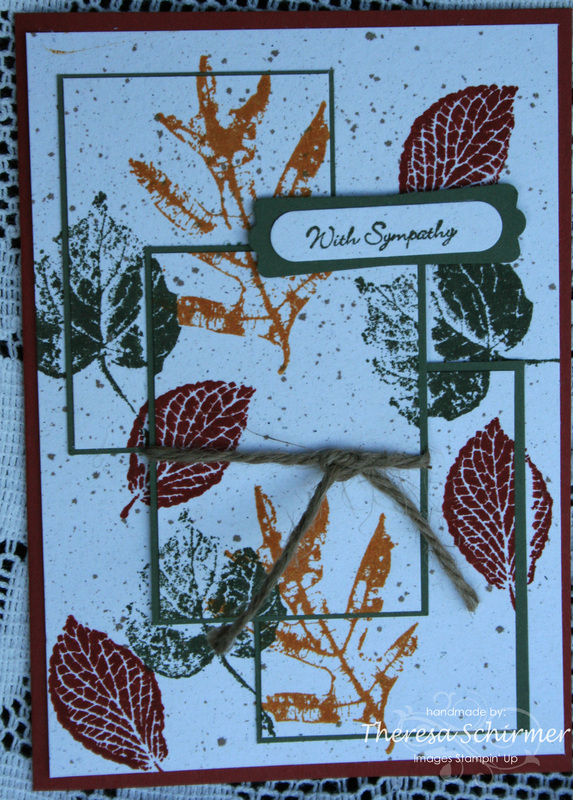 I used metallic brads to accent the tracks a bit more after cutting the images stamped onto Whisper White with Tangerine Tango. 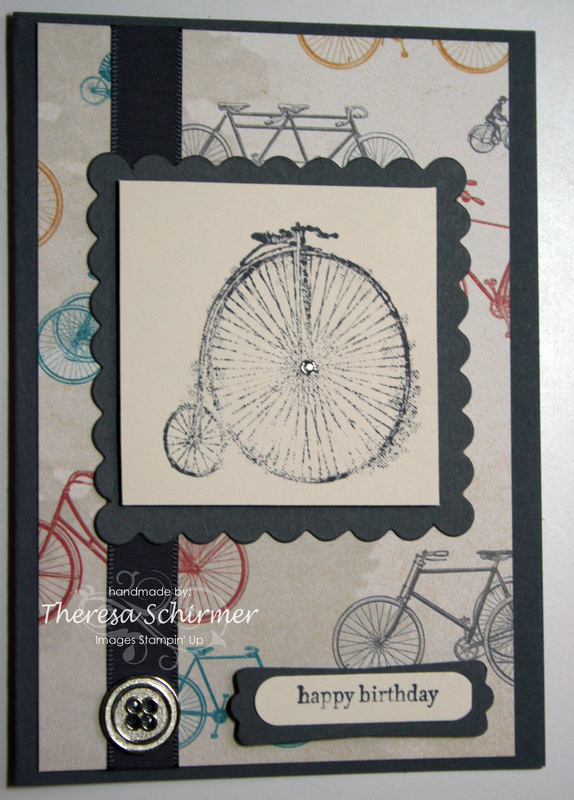 I used some of the printed paper from the paper stacks for the back ground and used black brads this time. This colour is generally known to be associated mainly with CAT. 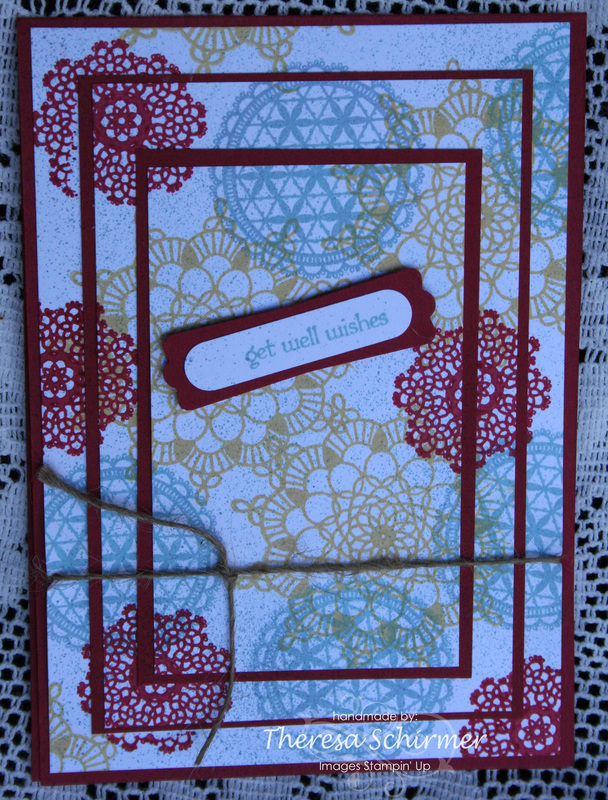 I really enjoyed making these simple clean and effective cards. I am sure that they are going to be popular with little and big boys alike. I know how much the big boys like their toys too. Just a quick post, thank you again for stopping by.